What was the German chancellor thinking this week when she practically launched Nicolas Sarkozy’s reelection campaign for him in a joint appearance on Monday? 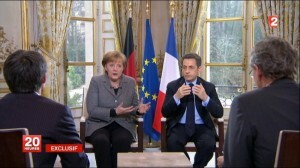 Taking a stand that has attracted international attention, the German chancellor made clear in no uncertain terms that she will actively support — and even campaign for — Sarkozy. As Der Spiegel reports, Merkel’s own Christlich Demokratische Union is working behind the scenes in concert with Sarkozy’s own Union pour un Mouvement Populaire. Although Merkel’s vigorous support is of a degree virtually unheard of in cross-border politicking, it has become increasingly common for EU politics to overwhelm national politics. As Silvio Berlusconi of Italy and George Papandreou of Greece will attest, Merkel watched as both elected governments fell last autumn, only to be replaced by unelected, technocratic (and budget-cutting) government more in line with Berlin. Although Le Monde stated that “Germany has never been at the heart of Europe,” Germany has, alongside France, always been the twin engine of European integration since the 1950s. With the reunification of Germany in 1990, the adoption of the single currency pursuant to the Maastricht Treaty in 1992, and the eastern expansion of the EU in 2004, Germany has, in its own way, become even more the heart of Europe than France itself. Germany’s central bankers have been uniquely influential in the development of the euro and the European Central Bank’s monetary policy, and that trend that has only strengthened since the 2008 financial crisis and the sovereign debt crisis within the EU that has dominated EU policy since 2010. But the risks to Merkel (not to mention France and Europe) are legion — in fact, it’s hard to see how Merkel’s move won’t backfire. The move will certainly enable the far-right to play the nationalist card, giving life to a cri de coeur for French nationalism from Front national candidate Marine Le Pen, who already fancies herself a modern-day Jeanne d’Arc. This could breathe new life into Le Pen’s campaign at a time when polls show Sarkozy finally breaking away with a clear lead over Le Pen in the first round. The move could also cement Sarkozy’s image as a president who wants to remake the French economy in Germany’s image, leaving to Parti socialiste candidate François Hollande the ability to portray himself as the defender of the French approach, if not the outright champion of French sovereignty. Above all, it could paint Sarkozy as the wounded and weaker junior partner in the Franco-German alliance just months after France lost its AAA credit rating and after Merkel facilitated the toppling of elected governments in Italy and Greece in favor of unelected officials. Further still are the risks to France and to Europe following the election. Merkel, who fears that Hollande’s election would endanger Franco-German unity at a time when that unity has never been more vital to the future of the EU and to the single currency’s viability, risks making Franco-German unity more difficult in the event of a Hollande win — a win that seems incredibly likely just 80 days out from the election. During the campaign, Hollande has argued for the renegotiation of the fiscal treaty on budget austerity, called for expansionary spending to boost French growth, and indicated he would support the creation of euro bonds and a Europe-wide fiscal transactions tax. 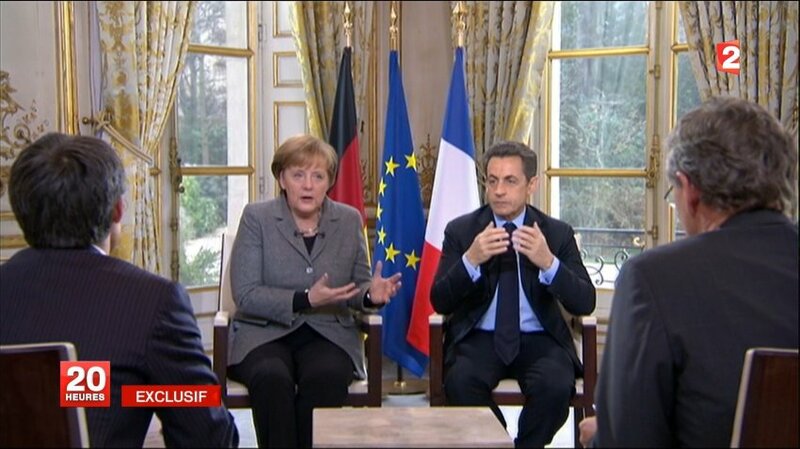 All of these campaign pledges firmly place Hollande at odds with Merkel. By no means, however, is Hollande a wild-eyed radical — he’s firmly in the center-left and far more market-oriented than his interparty rival for the nomination, Martine Aubry, would have been. Furthermore, it is certainly true that if, as polls indicate, Hollande defeats Sarkozy in the second round, Merkel’s hostility to Hollande — she hasn’t yet said whether she’ll even meet with him prior to the election — will exacerbate any Merkel-Hollande relationship, thereby causing even more anxiety among banks and investors. As such, Merkel’s active support also brings risks outside of France’s borders. Her active campaigning could transform the French presidential election into a de facto referendum on the European Union, almost seven years after French voters rejected the EU constitution in 2005’s constitutional referendum by a 54.7%-45.3% margin. That vote, which gave momentum to the successful “no” campaign in the similar Dutch constitution referendum just three days later, upended years of progress on the EU constitution. It is surmised that French voters wanted to register their complaints with the ennui of the Chirac administration in the 2005 EU referendum, but Merkel risks elevating the 2012 French presidential contest into an opportunity for French voters to register their complaints with the EU. Certainly, it would be a safe bet that French voters are less than enthusiastic today about the EU today than in 2005, with monetary union now in jeopardy and the EU’s southern periphery on the verge of financial collapse. None of this is likely to make bondholders feel any more secure about the ability of the EU to chart a consistent course for the future. All of which should make Hollande’s planned visit to London next month even more fraught.